It may be frustrating to watch the gold price remain dormant as stock markets continue to push higher. But while cryptos and Trump grab a lot of the headlines, you might be surprised to know there are significant forces behind the scenes that signal the gold market is not only strong but suggest something big is coming. Chinese coin and bar demand hit the second highest volume on record. In the third quarter, demand for physical metal rose an incredible 57% over the same period last year. 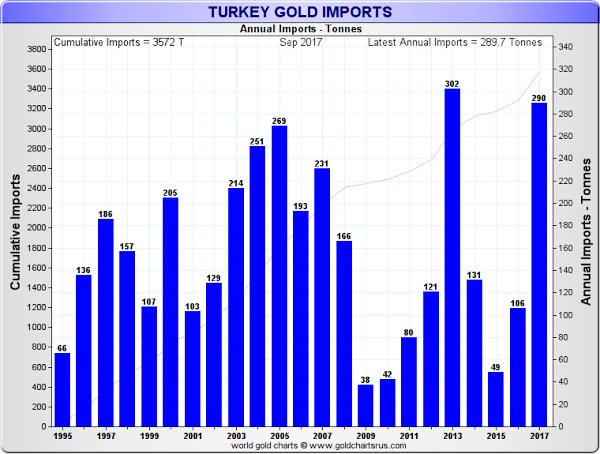 Gold bar and coin purchases in Turkey are almost three times higher than last year. Bar and coin demand in Europe rose 36% vs. 2016. German demand surged 45%. South Korea demand jumped 42%. It’s admittedly a small market, but this shows once again that investors turn to gold when geopolitical tensions rise. It’s clear that demand for physical metal is surging in many areas around the globe. You can see that a new record will almost certainly be set by the end of the year. Kazakhstan purchased 10.3 tonnes last quarter, and has increased its gold reserves every month for the last five years. While these increases are small in the big picture, it demonstrates that central bankers in emerging markets continue to see the need to add gold to their reserves. Why are so many central bankers buying so much gold? They clearly see the need to denominate their reserves in physical metal. Gold used in wireless applications grew 8% over last year. Demand for 3D sensors, used in facial recognition, were higher than projected. Applications in gaming, vehicles, and healthcare are projected to see growing demand. Kuwait Plans to Build a $112.5 Billion 'Gold City.' The Ministry of Commerce and Industry asked Kuwait Municipality to allocate a plot to build a special “gold and jewelry city” over a 100,000 square meter area, which would make it the largest of its kind in the region. The new “Gold Connect” exchange links the gold markets of Hong Kong and Shenzhen, and on the first day over nine hundred kilos of gold traded, worth 300 billion yuan, or $38.45 billion in US dollars. That’s not exactly chump change. Hedge funds and money managers cut their long positions the past couple months, but their net positions are still higher than the start of the year. According to Zero Hedge, Ray Dalio went on a gold buying spree last quarter: he increased his GLD holdings by a whopping 575% and became the 8th largest holder. If they’re right, new gold supply will fall by almost one-third by 2025. There’s no way that doesn’t have an enormous impact on the market and prices. Read our original article to see how you could be impacted. “The low-hanging fruit has likely already been picked” says Frank Holmes of US Global Investors. Explorers have to dig deeper… they have to venture further into more extreme environments to find economically viable deposits… regulations are tougher… production costs are higher… and no new method has been invented to extract gold from hard-to-reach areas. “Silver’s role in the auto industry will continue to grow due to safety upgrades in both human-powered and driverless autos, rear cameras, night vision, rear-object detection, and lane departure,” reports Steve Gehring, VP of safety and connected automation at trade group Global Automakers. “Silver’s use in solar panels will increase at least through 2020,” says Larry Wang of Heraeus Photovoltaics. This despite panel manufacturers actively working on ways to reduce silver loadings per cell. Silver paste is used in solar panels, and this chart shows the dramatic increase expected in demand over the next few years. China has imported significantly more silver the past several months. According to customs authorities, August silver imports soared 68% over last year. Total silver supply fell by 32.6 million ounces in 2016. Global silver mine production in 2016 recorded its first decline since 2002. Silver supply from scrap is falling and hit its lowest level since 1996. In the meantime, I continue to use the current soft environment to add physical metals to my portfolio. Check out the brand new Canadian Maple Leaf, both gold and silver, what are widely considered to be the most secure sovereign coins in the world.